Weho Daily » Will Pedestrian Safety Posters Cut Number of Accidents? Will Pedestrian Safety Posters Cut Number of Accidents? The City of West Hollywood is posting pedestrian safety posters in three locations for a one week period starting on Monday. Those who regularly read Weho Daily know that pedestrians are hit by vehicles on our streets almost every week. And oftentimes there is more than one pedestrian hit in a week. While it is great that the city and its Public Safety Commission are taking note and trying to do something about the problem, it’s hard to see how posters are going to make a bit impact, especially in only three locations for just one week. An “unveiling ceremony” is to be held at the site of one of the posters on Monday, which seems a bit over the top… we’re talking about posters at only three locations that will exist only for one week. In addition, the posters promote common sense pedestrian safety information that we all learned as schoolchildren growing up. There isn’t any surprising suggestion on ways that a pedestrian might be safer in the City of West Hollywood. They are pretty much exactly what you would expect, and as such, are probably going to be paid little attention. There isn’t even advice about avoiding distractions, such as texting, talking on mobile phones, or listening to iPods while walking or trying to cross the street. West Hollywood’s issues with pedestrian safety have more to do with the design of our streets and the car-centric culture of Southern California. Fault for the accidents that do occur usually cannot be placed squarely on the driver or the pedestrian. Sometimes there is fault on either side or both, but the inherent issues with the design of our streets and our car focused mentality deserve a good share of the blame as well. If Weho truly strives to be a walkable city, then drivers and pedestrians need to feel it when on our streets. The city needs to anticipate the behavior of drivers and pedestrians and then change the design of the streets and sidewalks to influence it. Some thought along these lines is happening, but few changes seem to be occurring as a result. There was an outcry of demands for safer streets after the death of a pedestrian on San Vicente back in July, but unfortunately, pedestrian safety has substantially cooled as a hot topic around town. These three new pedestrian safety posters, which will be on the street for just one week, are a sad reminder of just how cool it is and how little is being done. Next time there is an “unveiling ceremony” around pedestrian safety, let’s hope that it is for a new crosswalk, or signals at crosswalks that do exist. As a part of the Public Safety Education Campaign inaugurated by the West Hollywood Public Safety Commission, a poster on pedestrian safety tips will be on display at three local bus stops within the City of West Hollywood. The unveiling ceremony will take place on Monday, September 20, 2010 at 5:45 p.m. at the corner of Santa Monica Boulevard and San Vicente Boulevard. Members of the West Hollywood City Council and the Public Safety and Transportation Commissions will be on hand for the unveiling. The pedestrian safety poster will also be displayed at the corner of Santa Monica Boulevard and Doheny Drive, and the corner of Santa Monica Boulevard and Crescent Heights Boulevard. The posters will be on display for one week. The poster is part of an ongoing Public Safety Commission campaign designed to educate residents and visitors to West Hollywood about public safety topics including bicycle and fire safety, identity and Internet theft, and emergency preparedness. When it comes to pedestrian versus vehicle, the pedestrian almost always loses because of the sheer size and weight of the vehicle. The primary purpose of the poster is to call attention to the fact that awareness between both drivers and pedestrians is the best way to prevent accidents. 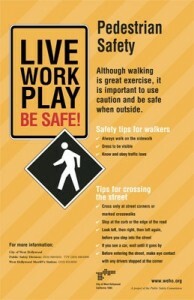 Although walking is great exercise, it is important to exercise caution and be safe when outside. As part of an ongoing Public Safety Commission campaign designed to educate residents and visitors to West Hollywood about public safety topics, we’d like to highlight the following tips on pedestrian safety. Always walk on the sidewalk. If there is no sidewalk and you have to walk in the road, always walk facing traffic, so you can see any car coming toward you. Dress to be visible. Brightly colored clothing makes it easier for drivers to see you during the daytime. At night, wear special reflective material on your shoes, cap, or jacket to reflect the headlights of cars coming towards you. Know and obey traffic laws. Cross only at corners or marked crosswalks. Cross only at street corners or marked crosswalks. Stop at the curb or the edge of the road. Stop and look left, then right, then left again before you step into the street. If you see a car, wait until it goes by. The look left, right and left again until no cars are coming. Before entering the street, make eye contact with any drivers stopped at the corner. If a car is parked where you are crossing, make sure there is no driver in the car. Then go to the edge of the car and look left-right-left until no cars are coming. Keep looking for cars while you are crossing, and remember, walk…don’t run. It is critical to teach children to look left-right-left before crossing streets. Cross only at designated crossings. Entering traffic mid-block or from between parked cars is dangerous. Teach children to never dart out in traffic. The City of West Hollywood has a public safety staff despite the fact that fire, police, and emergency medical services are provided here by county agencies. So they have to find make-work projects to justify their inflated salaries. They produced a series of pamphlets telling pedestrians to not run out into the street and die. Now it’s posters. Next year it’ll be a web video series. No one will ever care or pay attention to any of it, but the salaries will keep flowing. Mission accomplished.